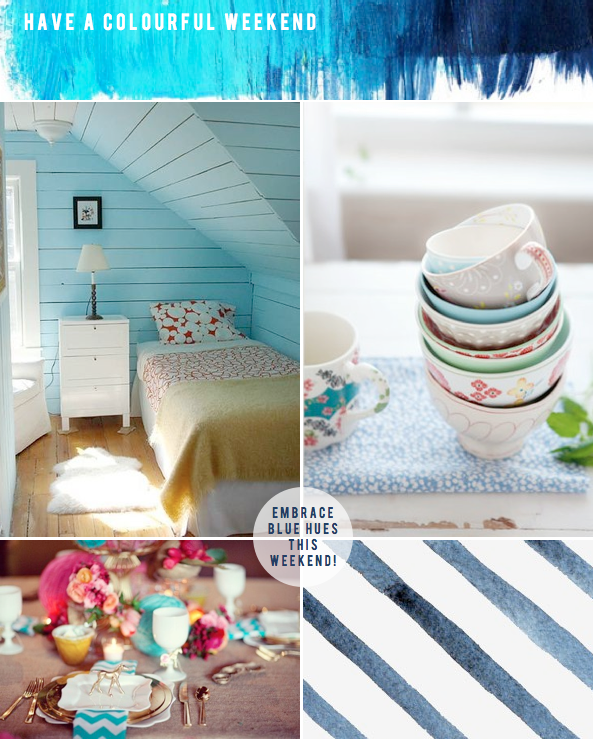 Bright.Bazaar: Happy Weekend: Embracing Blue! As the last few weeks of summer roll by here in London I'm keen to soak up every last drop of the bountiful blues associated with the season. Whether in the bedroom, kitchen or on the table, I just can't get enough of this hue. So this weekend I intend on getting as much blue into life as possible: from a turquoise cocktail on Saturday night to a walk under a clear, ever-lasting blue sky, my weekend involves many a date with blue! What's on your weekend agenda, friends? Blue sky, blue ocean, on my new blue bike. My home has lots of touches of blue. It's so soothing! Hope you stop by my blog sometime too! soak it up! unfortunately, it's probably going to be super warm here for at least another month. sad face. i wish i had a beach OR a blue cocktail (yum! love curaco in just about anything!)! sounds awesome. i plan on summer vino, sushi, and just relaxing. enjoy your blue (in a good way) weekend! I agree, blue is such an uplifting colour. The most popular one in the showroom all Summer! Our favourite piece has been this. *snort* reading up on setting up my own business.. and doing more designs- but , thinking of your colours for this weekend, I will try to come up with something blue... blue otomi variant maybe ? Have a great and gorgeosly coloured weekend! Loving that blue bedroom and the table setting. Those little animal figurines are a nice touch as well. LOVE that blue bedroom! I am determined to add lots of blue touches when I get my dream home... whenever that may be! !